My campaign is still on hiatus while my day job and writing schedule keep me too busy to plan for and think about GMing. However, I am playing weekly in a great campaign so I’m still getting my fix. Recently, I picked up the D&D XBox game and my wife and I have been enjoying it immensely. I can’t say whether it’s better than pen & paper roleplaying because it’s like comparing axe beaks to ogres. However, a point of great personal pleasure has been seeing how the D&D rules (albeit very modified for the XBox) manifest themselves in full colour, motion, and sound. For example, I love seeing how the various monsters move, hearing the noises they make, and watching their attacks and special abilities. The drow priestesses and the mind flayers are particularly cool. It’s great inspiration! IN ROLEPLAYING TIPS WEEKLY!If you’re a publisher or a retailer, you’re thinking about Christmas. I still have a limited number of advertising slots available in November and December. Recently, my employer gave me a 4th quarter overtime heads-up, which means I’ll be very busy ’till Christmas. So, to make life simple, I’d like to fill up the advertising schedule now so that it’s all taken care of and organized before life gets too nuts. For example, imagine a party of heroes who have just tracked down an informant in the grey area of town. They corner him and start demanding answers. Each PC might have questions to pose, or perhaps the players filter all their queries through the most charismatic PC. Either way, the informant better speak up! Imagine this scenario with a single PC. Is that character intimidating or charming enough to interrogate the informant by himself? Can the player think up enough good questions on his own? Can he think of them fast enough to keep the informant on the defensive? Long, thinking pauses kill momentum fast. The solution is to introduce one or more NPCs into the scene. It doesn’t matter if the NPCs are allies or enemies, neutral or biased, as long as they can help flesh out the encounter without tipping the balance overwhelmingly away from the PC. A rival gang member spots the scene and sneaks in, thinking to coldcock the PC. However, he spots the informant and decides to join the fun. The PC must choose between accepting his rival’s help and sharing the information, taking on both NPCs, or saving the encounter for another time. An innocent bystander stumbles upon the PC and his victim and freezes. This opens up the option of getting some help if the player plays it smart. An old drinking buddy happens by and, without hesitation, jumps in to help. Be prepared to portray more roles and personalities in single player games. Perhaps create a chart of unassigned, pre-fabricated personalities to use on-the-fly whenever an NPC is needed. Focus on how you can portray each NPC a little differently to help your player keep track of who you’re roleplaying at any given moment. It’s also beneficial to re-use NPCs as much as possible. This reduces your workload and helps you develop deeper and more complex personalities over time. It will help your player too as they’ll remember more NPCs and more about them through repeat exposure. Encourage your player to establish roots in the campaign and take on more responsibility. These things often manifest into tangible design projects that add new dimensions to game play, create storytelling opportunities, and can keep your player busy when you need GM-alone time. In solo player games, avoid any situation by design where the PC can reach a point of no return without the possibility of aid.A good example is the deep dungeon. What happens if the PC is sorely wounded in a tough encounter or through a bad dice roll on level 9? Chances are the character won’t be able to retreat all the way back to the top unless you do some contriving and fudging. The tactic of slowly wearing PCs down through minor encounters is another example. In single PC sessions, monitor the remaining resources of the character carefully. Eventually (and sometimes it doesn’t take long!) the PC will have so few options left that the situation becomes hopeless. “Shallow dungeons” of 1-5 encounters. Dungeons with many exits so the PC can escape without too much difficulty when he realizes he’s “out of ammo”. The classic D&D module B2 – Keep On The Borderlands is a good example of this design. Multiple avenues for aid, such as prisoners to be rescued, magic pools, potions, and detailed and informational clues. Good defense options, such as enhanced first aid kits, anti-venom magic or mundane treatments, temporary resistances to various foe attacks, secure places of retreat and convalescence, and so on. Keep in mind that by dungeon, I mean any adventuring locale, be it an underground cave system, ruins, a maze of dangers in the wrong part of town, an abandoned building, and so on. It’s hard to keep a single PC with one hit point or wound level alive. So, try to focus more on city, town, or village adventures that are, in general, less lethal.Keep NPC behaviour civilized as well. This doesn’t mean every foe has impeccable manners; it means murder and killing are generally avoided.For example, I recently played in a great battle that was based almost entirely on non-lethal combat (well, on the foe’s side it was, at least–we PCs are a murderous bunch at times). Not only did this battle help me learn the D&D 3.5 non-lethal combat rules better, but it imparted the feeling that my PC was in civilized lands.In single player games, your player will be more open to non-lethal combat and civilized adventures than multi-player groups often are. With no competition for GM and NPC attention, solo players might even enjoy this type of game more. Let the player drive the story and be ready to jump in with hooks and clues when needed. Railroading a one-player game has worse consequences than trying to railroad a group (it’s more obvious and more frustrating). The first three bullets were covered in Issue #194. The last bullet is required because the player needs to know what’s possible and the GM needs to be able to evaluate consequences quickly and confidently. Game world design involves more information than can be covered here, but the fundamental point is to be confident with running your game world whether it be a pre-created one or an environment you create on the fly. Also, avoid having the milieu revolve around the character. Try to impart in your player the sense that the game world is bigger than his PC is. This is much easier to do in a single player game because the GM can be more intimidating one on one in his various guises (i.e. there’s no other players around for support) and the PC is more vulnerable. Don’t dwell on this during sessions so much because it’s OK for the player to feel like the world spins around the axis of his PC once in awhile. Do a brief check-up between sessions and tweak as needed. This tip synergizes with the Avoid Deep Dungeons tip. Make adventures short and keep ’em coming at a fast rate. This maintains session momentum, imparts an ongoing sense of value and completion for you both, and lets you explore more ideas.Without other players around for confirmation and validation, it’s hard for the solo player to measure their progress. Enabling frequent successes (and challenges) lets the player know they’re doing well.It’s good to have long term, big goals like “overthrow the evil regime”, but ensure the player has at least one goal that is achievable each session. With just one player to manage, you can fit more game into each session. Use this as an opportunity to roleplay. 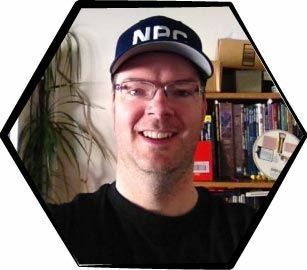 Develop your NPC portrayal skills. Even if the upcoming encounter is guaranteed to end up in bloodshed, give the foes a distinctive feel or memorable behaviour. The evil warrior starts the encounter off far away from the PC, but within yelling distance. As the character approaches, the fighter yells various insults and bangs his weapon against his shield, working himself up into a frenzy. The mindless giant bug goes through a strange ritual before each attack, much like some batters do in baseball or goalies do in hockey. The antennae twitch to the left, then the right, then point at the foe while the mandibles clack together precisely five times before hacking. This might seem corny, but it’s fun and it works. Another challenge to provide yourself is to increase the subtlety of your roleplaying. See how complex, subtle, and convincing you can be with your NPCs without completely losing the player and stalling the adventure. Twirl a fake moustache when the barkeep gives his daily receipts to the PC. Avoid looking in the player’s eyes when an informant provides partial information. See how subtle you can get because when your player figures out these “puzzles” they’ll be immensely satisfied– satisfied to the same degree as was the challenge in noticing and interpreting the behaviour. Don’t worry if the player doesn’t notice the tell the first time. You wouldn’t say “you missed a secret door back there, better go back” would you? 🙂 Instead, allow for repeat exposure, NPC recycling, and having fun while roleplaying. I think that to ignore or reduce the importance of equipment would remove a very rich source of game play. Many good challenges revolve around having or not having equipment. Trying to fix the gate to a old ruined fort using your engineering skills without any tools is much harder. How your players equip themselves demonstrates how attentively they are playing in your game world. We have had many interesting inter-character interactions where equipment is concerned. For example, a character argument about whether or not a fire should be made at a camp while running away. At the heart of the argument was that it was very cold and one character did not carry any blankets. For this reason, a fire was eventually built and the camp was discovered. Such a mundane item played an intricate role in events. We now have more and more character banter about events like this bringing the game to life without me even taking part. To speed up play time, our character sheets have all the standard items already in them with a place for how many and a price. Even clothing with a place for a colour and style. This speeds things up considerably. To keep my games running smoothly there are ‘shopping-admin’ breaks. These are normally at settlements when there are no actual plot elements being presented and the players have a chance to purchase all that stuff. This is usually where one player or other will make coffee and so on. Incorporate time intervals into adventures: “Okay, the note sets up a meeting on the sixth of Deepwinter in the square of the broken anchor near the docks”. Best done sparingly. Ask them to train between levels. This takes time (not to mention money :). Have them wait for items. One does not simply waltz into a blacksmith with a pile of ill-gained gold and then calmly waltz out with half the shop’s inventory. Constructing plate armor takes a lot of time. Give them a home. Be it a keep (for high-level characters) or a guild or a house, it will provide a valuable time sink for them. Cultivate a friendly relationship with your mage player. Nothing burns up time like a mage who decides to beat Elminster in the number of researched spells. Your player witness the changing of the seasons, the coming of harvest time the preparations for winter. They see a local festival or religious observance. Kingdoms pass new laws or change subtly in organization. If they feel that they are in a living world that exists independent from them and their exploits they will change their pace to match that of the world. This later becomes an excellent tool for player manipulation, lulling them into the slow stately pace of the game world and then springing some violent disaster that prompts frantic responses from everybody. Speeding up the pace will leave a distinct impression on the players. And the obligatory EvilDM solution: Maim them so badly in the last adventure that it takes at least four weeks for the baneful effects to wear off. We rotate the GM-ship in our games, so during the time that we have been playing, I have played three games and DM’d one. When we started out at first level, equipment management wasn’t too big of a deal; but now that we are eighth level it is becoming more of a headache. We usually use a porter/street urchin/inn keeper to fetch mundane equipment (sunrods, caltrops, torches and the like) and will pay a little extra premium for the service. And while we do use electronic character tools (eTools) to keep track of our characters, it still can be a pain to keep track of potions/scrolls and other items. This has also made the gathering of equipment, found as loot, to become a major time drag for both the DM and the players. How many times has a player wrote down a potion/scroll only to have it sit there on the character sheet and never get used? Or what if items on the master loot list don’t get distributed or are lost or accidentally duplicated? What if the loot tracker misspells the baddies’ name and the DM has to spend 15 minutes flipping through the module to identify something you killed three sessions ago? Also, it is a very big pain to erase and re-write down frequently used items such as healing potions. White is reserved for mundane/Masterwork items. The items can be distributed on the spot to the rest of the players or after they have been identified. Once identified, the price of an item (as well as any charges/caster level/etc.) is also added to the card so that if it needs to be liquidated the sell price can be taken as a percentage of the MSRP. Potions, scrolls and wands are kept on cards and then destroyed once depleted/used. Duplicate scrolls and potions can be added to the same card, but whenever it is used, the item is scratched through with a pen or some other permanent marker. Magical items are identified and a player selected to receive the item. At that point he/she takes the card and does not destroy it until it is integrated onto their character sheet. For an advanced usage, we use a simple 1-hole punch to put a hole in the top right corner and then the use a single binder ring to keep them together. In addition, frequently used items, such as healing potions, can be laminated as permanent tokens that are taken away when used and given back as they buy more. This system is working out supremely well in the organization and distribution of equipment. In addition, when the players get in a bind or during down time, they tend to flip through their specialty items to see if they have something that can pull their characters out of the proverbial fire. This gets the players more familiar with what they are carrying, cuts down on the amount of times we have print and re-print our character sheets from the computer (saving both paper and expensive ink), and makes identifying and distributing items MUCH faster. Hope this helps out others. The overall story can easily get corrupted (hacked apart, so to speak) because of idea that instead of just looking for adventure, or the holy grail, or whatever, some of the characters are also looking to get a leg up on the other party members? Often a keep, castle, or whatever, helps a lot since many of the machinations of the players take space, take time, and it’s good to have a home base for your evil plots in the night. A well-defined land, or city, or whatever the players are expected to spend the most time in, helps a lot since then the characters can start plotting with local thieves’ guilds, evil barons, terrorizing the local populace, etc. A fair number of evil campaigns are driven by greed. Often they will start on a trek because of some promised loot and more often than not, not worrying about giving whatever it is to whoever might have hired them to find it. Myself and other DMs have had campaigns start off from simple mentions of a dragon hoard or excessively rich towns to the north (the player decided they would rob the entire town). Evil characters in our campaigns often only get along because of a respect for the other group members’ skills. A healthy fear of dying trying to steal from the lawful evil monk will stop you from attempting to rob him blind. That being said, we almost always have one PC try to kill another in games. Not all PCs of course, but some of them just don’t get along. We have a group of around 5-7 people so that can mean a lot more interaction between players. The DM is never prepared for what the party is going to do next. For instance, we had a person enter our evil game late. I was playing a wizard who specialized in controlling minds and another was playing a monk whose main goal in life was to build a monastery. We both had built up a pretty big reputation with the group and with the locals, so people didn’t mess with us much. When this new player joined, he decided to create an uber assassin who believed himself invincible and was also really annoying. Didn’t take but 10 minutes for him to get pissed off enough to attack the monk (to show him who was boss, so to speak), but he had turned his back to me to do so. I charmed him and that was that (I owned him for a week at that point). We realized he would just try to kill us as soon as the week was up, so we searched for and found a potion of forgetfulness and had the assassin tell us his full life story. We then had him drink the potion, wake up on one of our beds and convinced him he been summoned by us because of how good he is. We had brought him here to help us, but he had to listen to us or we’d just send him back. We used his known life story to convince him we knew everything about him. 2-3 hours later the game was half over and we hadn’t even left the keep. We all had a great time, but none of us expected it to go down that way nor that just the introduction of a character would take that long. There are good links in the Real Pirates and Their History section. I recommend role-playing games as a positive means to encourage cooperative behavior in siblings. The other evening I was desperate for a way to get my boys out of the whiny “I don’t have anything to do so trying to kill my brother is a good idea” phase. I pulled down my old seldom-used copy of the Dragon Strike game and got it out. Of course they weren’t interested, so I just went ahead and started laying it out on the table and setting up the simplest scenario. And, of course, by the time I was halfway through I was receiving pointed and increasingly sarcastic comments about my setup speed or lack thereof. My sons are both adopted and were 5 and 2 when I adopted them; now 9 and 6. They had spent their entire lives before adoption in an orphanage in Latin America. The older is bipolar and ADHD and the younger is incredibly smart (and smart-mouthed) and hyperactive. Both boys had to literally fight for their food in the orphanage and I have spent the last 4 years trying to civilize them, with limited success. I don’t often let them play with kids their own age, for example, ’cause the other kids end up crying and I end up explaining to angry parents. I have had to deter well- meaning but ignorant interference from various outsiders several times because they literally thought the older boy was trying to kill the younger. Anyway, that’s just to set the stage for what happened in this game. As GM I modified the rules to make combat simpler. This was to make the game more accessible to my older son (short attention span, over-excitation leads to instant rages) and my younger son (who, although he is bright, is after all, only 6). The scenario was for the adventurers to work together to rescue a captured wizard from a dungeon. My intent was to introduce the boys to RPGs with the idea in mind that I’d see more cooperative behavior by the time they were (say) 18 or so. Until halfway through the game they were totally at odds, with the older (warrior character) accusing the younger (archer elf character) of being too young to play (almost correct) and the younger taking off on his own to find something to fight because it was more fun fighting and dying alone than cooperating. Finally I began to twig to the idea that as GM I could influence their behavior by rewarding good behavior and punishing bad behavior. Rewards were funny and/or silly comments that made them giggle. Punishment was a bombastic statement that the universe was going into stasis for 10 seconds until the gods were no longer offended by the lowly characters’ behavior. This was not only effective, it served to focus their attention more on the goals of the game. Anything longer than 10 seconds would simply not have worked, given the ADHD / hyperactivity. Finally, my older son found the wizard and was on his own trying to fight the monster jailor, with little success. He had one 10d die to roll against the monster’s 8d/10d/12d dice rolls. His brother, seeing the fighting as fun, got into the fray as well, but they were both losing by fighting separately. My older son then asked if they could combine their die and roll together as one combined character. As GM I instantly modified the rules to allow it. The moment they both realized they were winning the fight, they cooperated flawlessly. I was astounded. I had NEVER seen this level of cooperation before in the last 4 years. Of course, the moment they defeated the monster and had to cooperate to carry the wizard back to the dungeon exit, it was another story. However, given the brief success, I was unwilling to let them revert, so I amended the game and my approach to place the dungeon dragon on the table and make his presence incredibly intimidating. They cooperated again and scurried off with the wizard, and won the game. Don’t let the game rules stand in the way of achieving your greater aim in parenting. Cooperation can be achieved if the external enemy outweighs the internal enmity. Role-playing can be a very intense emotional experience, especially for younger kids, and you must be careful in your approach. Used with loving care, RPGs are positive for kids.